Part 23 of Shipping Wonders of the World was published on Tuesday 14th July 1936. 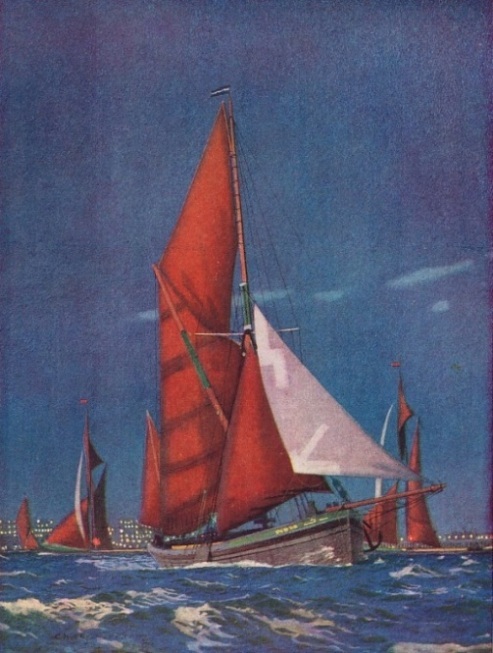 This issue included a colour plate illustrating Spritsail Barges on the River Thames by Charles Pears ROI which accompanied an article on Thames Sailing Barges. It was attached to page 732 of this issue. 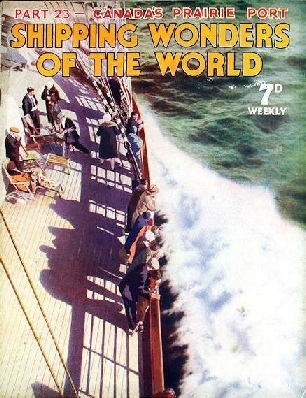 This week’s cover represents a scene on the deck of the North German Lloyd liner Bremen in mid-ocean. The Bremen temporarily regained the Blue Riband of the Atlantic for Germany in 1929. She is the sister ship of the Europa. part 6, part 11, and part 20. The story of the first man to sail single-handed round the world, concluded from part 22. Oil and spirit in bulk form the most dangerous cargo that ships have ever carried. Many special construction al devices have been evolved to obviate, as far as possible, the risks entailed by this perilous cargo. One often hears sailing ship enthusiasts say that romance went from the sea with the passing of the sailing ship. But romance is an integral part of the sea, and one of the most romantic stories of modern shipping is that of the Oil Tanker. During the last twenty years or so there has been a great increase in the use of oil and these long, low ships bring it from distant countries to serve our everyday needs. Oil and its derivatives are used in our motor cars, our railway engines and our ships; they are used also for domestic purposes such as lighting and heating. Oil is now a commodity of international importance and will play a significant part in future history. There is in existence at present a vast fleet of oil tanker vessels, with a total gross tonnage of over 9,000,000. Before 1914, the total tonnage of oil tankers was rather less than 1,500,000. This chapter is by A C Hardy and is the third article in the series on the Romance of the Trade Routes. Every year since 1928 the Royal Navy has admitted the public into the dockyards at Portsmouth, Plymouth and Chatham during Navy Week. Thousands of people are this enabled to see the Navy at work. The institution of Navy Week has been instrumental in enabling us to widen our experience, and the great success of this annual event is a tribute to our ability to answer the call of the sea when the call is sounded. One of the many charms of Navy Week is its spontaneity. Although careful organization is necessary to its success, the general public sees nothing of what goes on behind the scenes - and an air of care-free informality prevails. The time of the Fleet is so taken up with routine work and exercises that there is not time in which to rehearse elaborate displays; yet the public responds with more than ordinary enthusiasm and every year Naval charities benefit, as indeed they should. The Navy Week Committee deserves all our congratulations for the work it does. This chapter is by Commander G A B Hillis. The final form of the marine reciprocating engine was of the vertical type using steam in two, three or four stages of expansion. This chapter is by F E Dean and is the sixth article in the series Marine Engines and Their Story. When the Germans scuttled their interned warships at Scapa Flow, Orkney, in June 1919, most people thought that the ships had found their last resting-place. By a series of salvage miracles many of the seventy-two German vessels have now been raised. This chapter is by David Masters and I written from personal experience. The author visited the scene and went down with the salvors at Scapa. This is the eighth article in the series Dramas of Salvage. The article is concluded in part 24. This chapter complements that published in part 19 which told the story of the surrender and scuttling of the German High Seas Fleet. The strongly-built and picturesque barges which may be seen on the Rivers Medway and Thames are fine sea-boats and still retain many of the traditional features of the first craft of their type. Although the Thames barges are essentially English craft, they do not confine their activities to the Thames. Many of them sail as far afield as France and Holland. Some years ago tow of them were temporarily rigged as ketches and went out to South America. Frank Bowen knows the Thames barges and the men who man them as well as any one, and in this chapter he tells of the history of the barge, discusses its curious rig and describes the famous annual races on the Thames and Medway. SS Pennyworth of Newcastle-on-Tyne, arrived at Churchill with a cargo and passengers - one of the first vessels to reach Canada by this route. D Wilson MacArthur travelled in the Pennyworth, and this writes of this modern romance from first-hand experience.